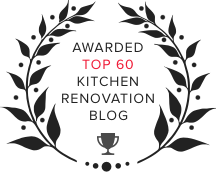 To tip or not to tip, that is the question—or, it's certainly one of the questions you'll need to answer as you work with your kitchen designer to create customized, efficient storage spaces. One of the most popular—or not—depending on your preferences is the tip-out tray. Are Tip-Out Trays Right For You? 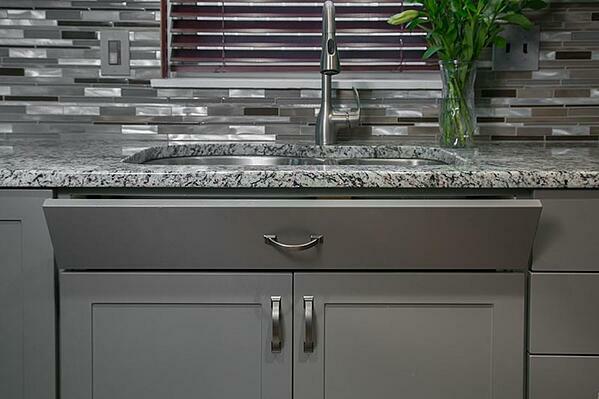 Tip-out trays live directly beneath the sink cabinet surface. 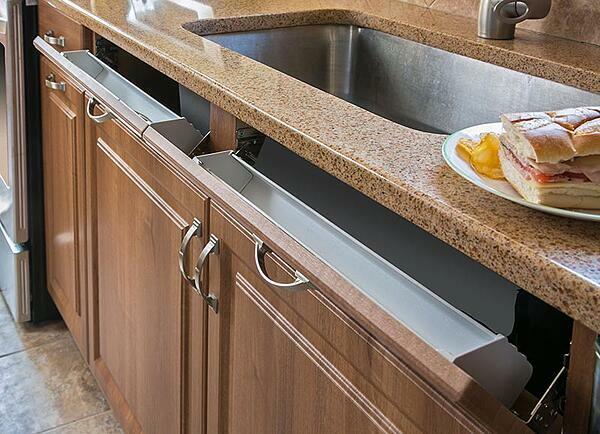 Aptly named, since they "tip-out" and offer a plastic or metal storage tray underneath the sink. Tip-out trays were originally designed to store sponges, scrub brushes, bottle brush cleaners and all those items that quickly clutter up the sink and countertop area if you aren't careful. However, anyone who has had or used a tip-out tray knows that the metal tray holding those cleaning items can get a little gunky if you aren't good about cleaning it every once in a while. Acknowledging that fact, we still find them to be totally worth it. Here are the reasons why we still think tip-out trays are worth installing. Clutter is an eyesore, and there are very few countertop organizers that keep the sponges and other dish, pot and pan cleaning tools organized. For that reason, no matter how hard you try, all that stuff will wind up looking like a mish-mash when left up on top. Keeping them in the tip-out tray means they remain out of sight when not in use, but are easily in reach when needed. 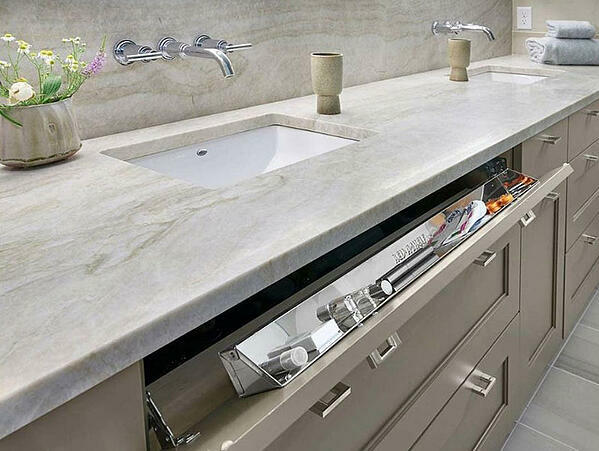 The space under the cabinet is traditionally where people keep things like slide out trash cans, household cleaners and cleansers, and so on, but those items only take up so much space from the bottom up. That leaves lots of space in the upper several inches of the box sitting empty. Tip-out trays were a genius addition to the kitchen storage solution arsenal, using up space that was languishing otherwise, and space/storage efficiency is always a bonus. 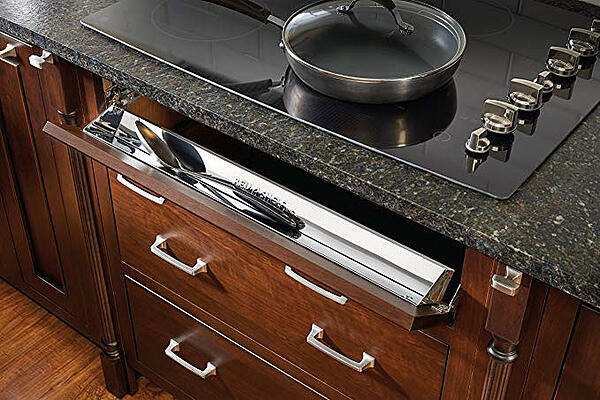 In fact, forget the sink—install a tip-out tray below a cooktop like the one below, and enjoy the convenience of cooking utensils easy at hand! While they were ultimately conceived to store sponges and dish cleaning tools, that's not written in stone. 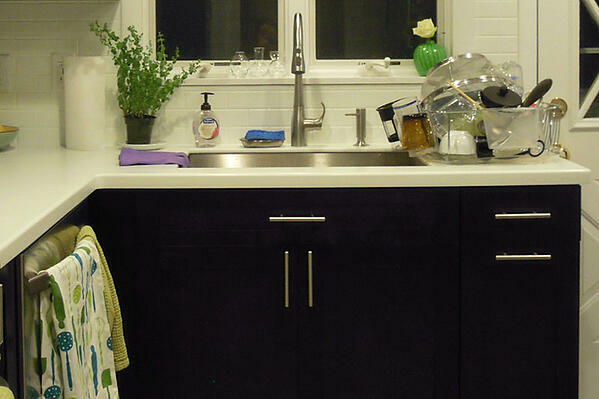 If the "gunk" factor turns you off, we recommend keeping that space for dry kitchen essentials such as the extra sponges waiting in the lineup, the Allen wrench used to free a stuck garbage disposal and the most go-to kitchen tools such as screw drivers, pliers, wrenches and a small hammer. 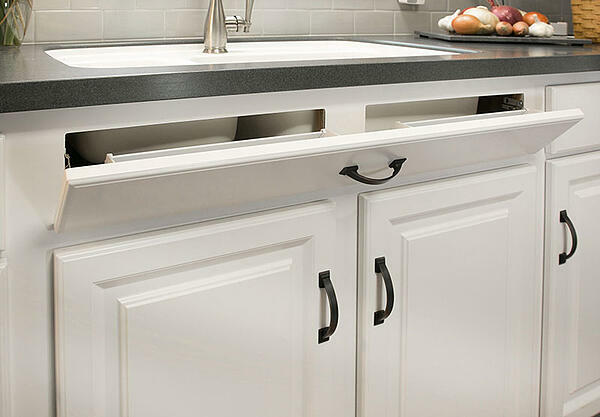 Have little ones who are perpetually frustrated by their inability to access cabinets due to safety locks? Those tip-out trays can also serve a place to keep small toys and fun tchotchkes they can have access to 24/7. There's really only one "con" to tip-out trays and that's the fact that they will require cleaning weekly, monthly or bi-monthly (depending on their status) to get rid of the grime that accumulates from the moisture and soap residue that accumulates on the bottom. One easy solution is to line the trays with absorbent cloth materials that can be peeled out, washed and re-used. If you put a layer of foil or cling wrap down first, then the cloth—you may never have to scrub the trays at all. 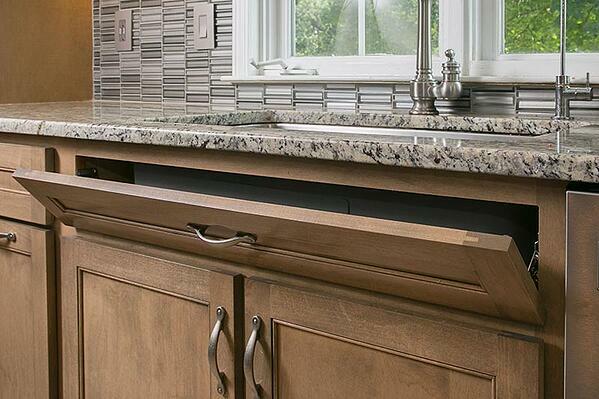 Tip-out trays are a personal choice, and the team at Kitchen Magic looks forward to working with you to make all the right choices required to design a personalized kitchen for your home. 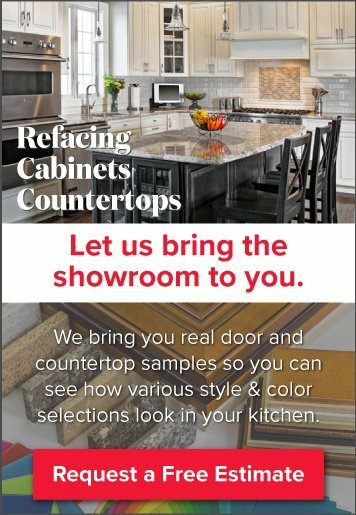 Schedule a free in-home consultation and we'll help you design the functional, storage-friendly kitchen of your dreams.